All the images on this page are larger than life-size. 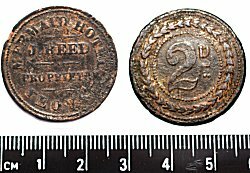 Lead tokens appear to have been used in Britain from the late-thirteenth century to the early-mid nineteenth. The former period is the one during which fractional denominations were first introduced, rather than using pennies alone and chopping into halves and quarters, whilst the latter is the period during which the Government first successfully overcame the shortage of small change which had plagued the country for several centuries. Even the smallest official coin, the farthing, was a significant portion of a man's weekly wage, and hence practicality drove communities to resolve a situation which the authorities were not able to. No official record survives of who struck them, where they were struck, what they were valued at or under what local agreement they circulated. They probably had a very limited geographic radius of use and were probably struck or cast by some such craftsman as the local blacksmith. Not all crude lead will have been coin however, some of them were almost certainly passes, whilst others will have had their value defined in terms of commodities or services rather than the currency of the day. The earliest pieces, circa 1275-1500, tended to be pewter rather than pure lead and were almost certainly of ecclesiastical origin. Many, but not all, of these early pieces are very small - sometimes as little as 11mm as shown in the two examples below at right. Later pieces are usually pure lead, typically increasing to about 15mm to 17mm in the Civil War period and often up to around 25mm in the 18th century, although there is no standard of manufacture to which anybody was obliged to conform. Precise dating of pieces is difficult, but occurrences before the Civil War are exceptionally rare and there are few also after 1820. The lead tokens in my collection, shown above, range in size from 22mm at left, to 12mm at right. The token at left is 4.2mm thick and weighs 11g while that at right is 1.7mm thick and weighs less than a gram. Although these examples are not specifically from Yeovil, they are typical of the area. All decoration is on the front, or obverse, which tends to be rounded while the back of each token, or reverse, is flat and undecorated. The maker would simply carve his design into a piece of wood, clay or soft stone to make a mould, then pour molten lead into the mould thereby giving depth to the design. As the molten lead settled and solidified the reverse would naturally become flat. When cooled, it would simply be tapped out of the mould. There is little identification on crude lead and designs are various. A few appear repeatedly, such as the flower of six petals, the cartwheel, the lis and the anchor; these are thought to be stock designs of semi-obscure ecclesiastical origin. The cross and pellets, the example above left, is fairly frequent and presumably derives from the coinage of the first three King Edwards. 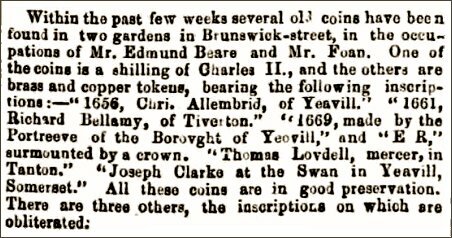 Most Yeovil trade tokens were issued by tradesmen following the death of Charles I in 1649 in order to overcome the lack of small change in general circulation to enable trading activities to proceed. The token was in effect a pledge redeemable in goods although not usually for currency. These tokens never received official sanction from government but were accepted and circulated quite widely. No copper coinage was minted during the Commonwealth and the resulting paucity of small coinage was met by these independently-produced and completely unauthorised tokens of brass, latten (a copper alloy similar to brass) or pewter. 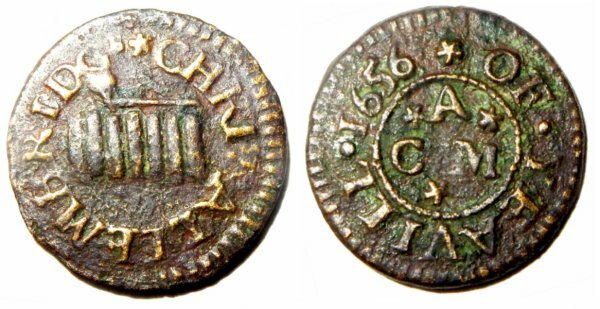 From 1672 farthings were minted again, in the reign of Charles II, with the consequent demise of trade tokens. The value of a farthing in the 1650s was roughly equivalent to £2 at today's value. All tokens illustrated below are farthing tokens except the first, which are halfpennies. 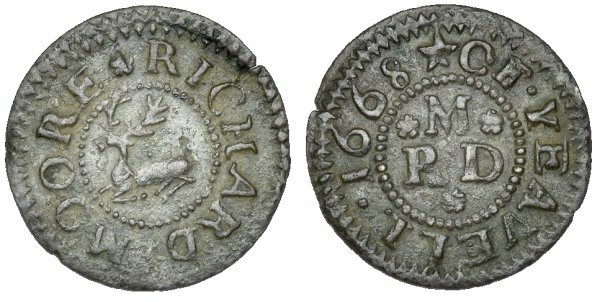 Reference numbers, such as (W.326), are from Williamson's "Trade tokens issued in the seventeenth century in England, Wales, and Ireland". Above are halfpenny tokens, all from my own collection, shown against a scale to give a better indication of size, although it cannot show how thin the tokens are - about 0.75mm. The first four shown above were issued by the Portreeve on behalf of the Borough of Yeovil. 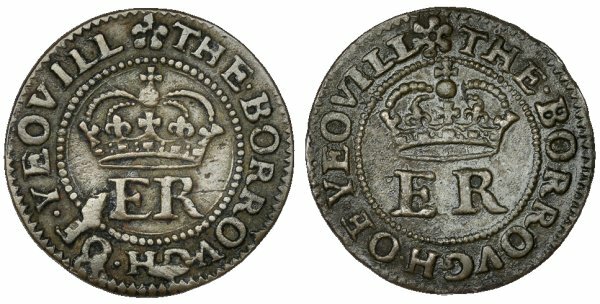 On the obverse states "MADE BY THE PORTREEVE OF" around a twisted wire inner circle with a central date of 1668, while on the reverse is "THE BORROVGH OF YEOVILL" around a twisted wire inner circle enclosing a crown over the initials 'ER', probably the initials of the Portreeve in 1668 whose name is, unfortunately, not known. 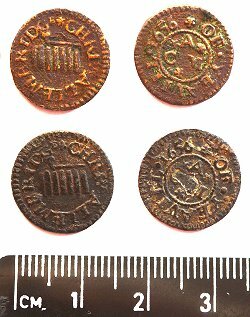 At least three versions, with extremely minor differences but sufficient to show different dies were used, are known for the 1668 tokens. 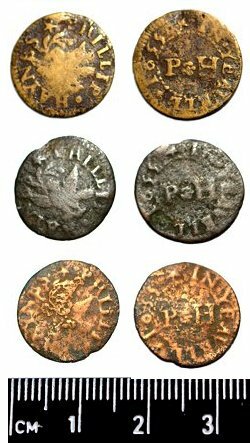 These tokens were also produced in 1669, as the last example. 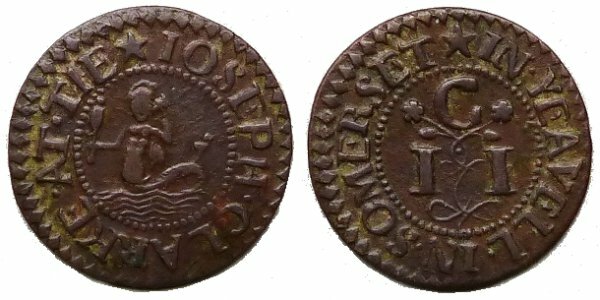 The 1669 issue was made from a different die, but are all but identical (see below) to the 1668 version except for the date, although the 1669 issue is quite scarce - in my collection are twelve of these halfpennies of which only three are from 1669. These two detail photographs indicate the standard 1668 issue (at left) and a variant (at right). The variant differs in two respects; firstly the 'F' of 'OF' touches the quatrefoil rather than being separated from it as indicated by the yellow lines, secondly the alignment of the 'V' of 'PORTREEVE' is clearly aligned differently as indicated by the green lines. In my collection ten examples are standard and two are variants. The obverse of the 1668 (left) and 1669 (right) issues - apart from the obvious date difference note that the three flowers above and below the dates are 5-petalled in 1668 but 6-petalled in 1669. The alignment of the outer text also differs significantly. The reverse of the 1668 (left) and 1669 (right) issues. The three main differences are: the 5-petalled flower between the words 'YEOVILL' and 'THE' is directly above the 1668 crown but is 6-petalled and offset left in the 1669 die; the crown of 1669 is cramped below the inner twisted wire ring and finally the initials 'ER' are spaced farther apart in the 1669 die. At top, for clarity, is an illustration of a farthing token issued by Christopher Allembridge (the younger) and, below it, are two of the three examples in my collection. 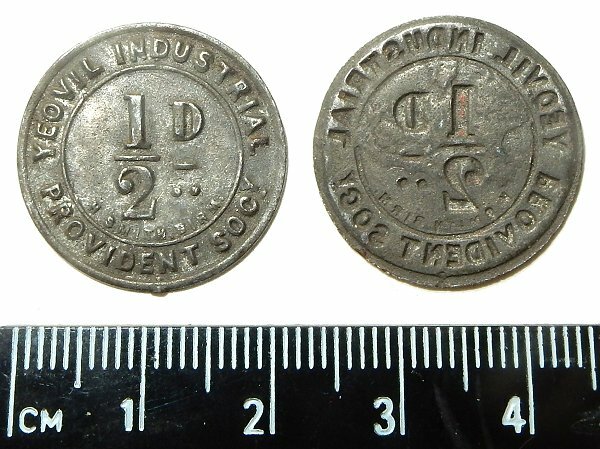 Both these tokens measure 15.48mm across, while the third measures 16.98mm. I have yet to determine whether this is due to wear or a different die. While the illustration has six twists of tobacco, the actual examples have seven twists. Christopher Allambridge was recorded as a "Tobacconist of Evil" in 1634. However, since the wife of Christopher Allembridge the elder was named Joane and he died in 1645 it is clear that this token was issued by the son, Christopher Allembridge the younger, whose wife's name began with an 'M'. This farthing token, about 12mm in diameter, was issued by John Boone of Yeovil. 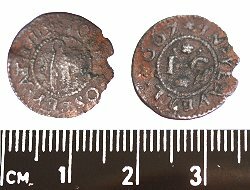 The token is not dated, although almost certainly mid-seventeenth century. The obverse has a fine twisted wire outer circle, the name "JOHN BOONE", an inner twisted wire circle and a central motif of a hand (or a glove?). The reverse has "IN YEOVILL" around a twisted wire inner circle and the initial B over I(J) A within. Tokens usually had three initials for the two forenames of the issuer and his wife plus their surname. 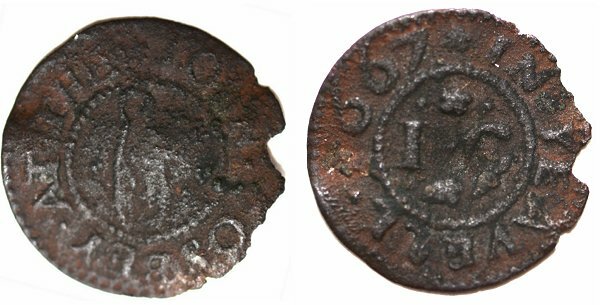 This farthing token, about 15mm in diameter and just half a millimeter thick, is from the Angel Inn, Hendford, and dated 1652, the earliest recorded for Yeovil. It depicts an Angel in the centre of the obverse, together with the licensee's name, "NATHANIELL CARYE". On the reverse is inscribed "OF YEAVELL - 1652 - C.N.A.". A variant is known in which the right hand side of the angel's dress points to the 'N' rather than the 'I'. 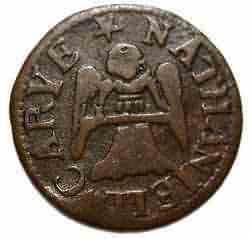 The example from my collection, seen here, shows the angel on the obverse with Nathaniell Carye's name around it. Unfortunately the reverse is worn almost smooth and lacks all detail. 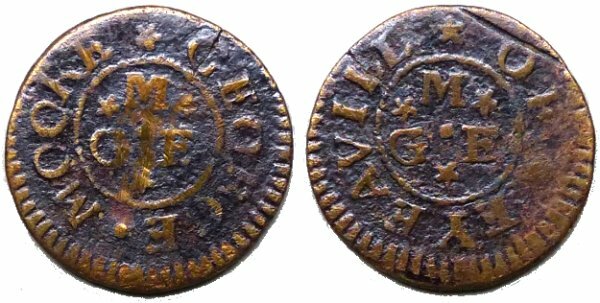 This is a farthing token, some 15mm in diameter, from the Mermaid Hotel, High Street, undated but falling within the period 1649 to 1672. It is inscribed on the obverse "IOSEPH (Joseph) CLARKE AT THE" around a twisted wire inner circle containing the image of a mermaid. On the reverse is "IN YEAVELL IN SOMERSET" around a twisted wire inner circle containing "C.I.I." - again these three initials represent the forenames of the issuer and his wife plus their surname. The obverse shows the name "IOHN COSBEY AT THE" between twisted wire inner and outer circles with a pair of shears within. The pair of shears possibly denotes his trade as a tailor, although the British Museum website suggests that he may have been "Associated with an establishment possibly called The Shears". The reverse has "IN YEAVELL" and the date 1667 around twisted wire inner and outer circles and the initials I (J) C within. Williamson attributed this token to John Coshey (as does the British Museum) however this detail of the above token from my collection certainly appears to be a letter 'B' rather than an 'H', rendering the name Cosbey. A farthing trade token issued by William Daniell. The obverse shows the name "WILLIAM DANIELL" between twisted wire inner and outer circles with three cloves within. The reverse has "IN YEAVILL" and the date 1653 around twisted wire inner and outer circles and the initial D over WM within (standing for Daniell, William and his wife Mary). The three cloves show an association with the Worshipful Company of Grocers whose arms contain nine cloves in three groups of three, since they were responsible for maintaining standards for the purity of spices. This is the William Daniell token in my collection. It is in poor condition but will have to do until I can get a specimen like the one below. This farthing token was issued by John Hayne in 1652. The obverse has a fine twisted wire outer circle, with the name "IOHN HAYNE" around a central motif of a lion rampant (you'll have to take my word for that). The reverse has "IN YEAVELL" and the date 1652 between twisted wire inner and outer circles and the initials "H I (J) D" within. A variety, lacking a date, reads "OF EYEAVELL" (W335a). The three Phillip Haynes farthing trade tokens seen at left and the large image below, all from my collection, are each about 15mm in diameter. Each shows subtle details not visible in the other examples. The obverse has a fine twisted wire outer circle, seen clearest in the second example, with the name "PHILLIP HAYNES" around the edge. In the centre is a dove with an olive branch in its beak. 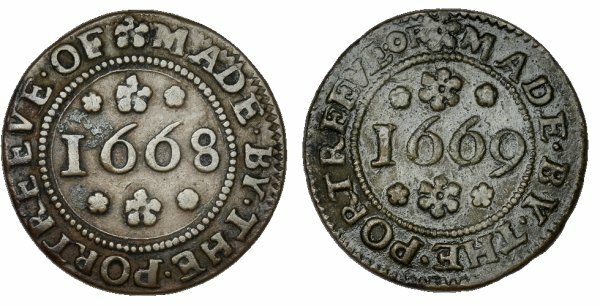 The reverse again has a fine beaded ring around the outside, seen clearest in the first example, with "IN YEAVELL" and the date 1655 around the token. Then comes an inner beaded ring with the initials "PH" in the centre. The tokens are seen against a scale to give a better indication of size, although again it cannot show how very thin the tokens are - about 0.75mm. 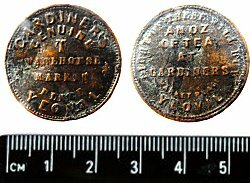 A farthing token, again only about 12mm in diameter, was issued in Yeovil by George Moore. It is inscribed on the obverse "GEORGE . MOORE" within an outer twisted wire circle and an inner twisted wire inner circle contains the initials "MGE" separated by three small stars and a central 'dot'. The reverse carries "OF . EYEAVILL" within an outer and inner twisted wire circle and a repeat of the initials. At least one variant, from a different die, is known. This farthing token, only about 12mm in diameter, is probably from the White Hart (an early name for the Castle Hotel), Middle Street, dated 1668, depicts a hart on the obverse, together with the licensee's name, ''RICHARD MOORE'. On the reverse is inscribed 'OF YEAVELL - 1668' around a twisted wire inner circle containing 'M.R.D.' being the surname and two fore names of the issuer and his wife. At least one variant (W.338a) from a different die, is known. At left, above the scale, is a farthing token, shown in obverse and reverse, issued by Ambrose Seward from my collection. The token has, within a twisted wire outer circle, the words "AMBROSE SEWARD . IN" around a central cross pattée. The reverse has an outer twisted wire circle with "YEOVELL . IN . SOMERSET", an inner twisted wire circle and central initials "S A A". 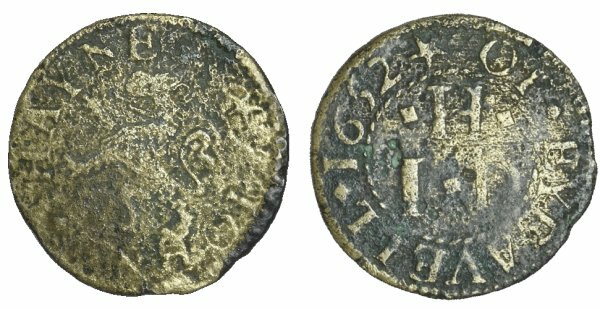 Interestingly the token is not dated, although almost certainly mid-seventeenth century, and the lower four tokens show variations that prove that at least four issues of the token were made, probably over a period of several years. The second example has a much thicker cross, the third example (W.340) omits the word "IN" which is replaced by three small stars, while the bottom example has the three stars replaced with two dots and a star. In 1647 the Quarter Sessions recorded that Ambrose Seaward was a 'Constable of the Borough'. In monthly Poor Rate Return it was recorded that Ambrose paid 8s 0d on a property in the Borough and a further 8s 0d on a property in Kingston. 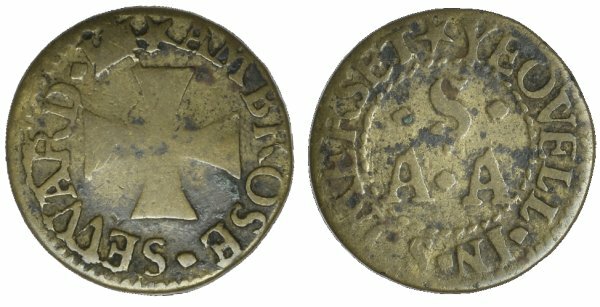 It is most likely that the Ambrose Seaward who issued these tokens was a mercer and certainly the Woborn Muniments recorded that (another) Ambrose was a mercer in 1710 and Custos of the Almshouse in 1704 and again in 1716. This report is from the Somerset County Gazette's edition of 4 May 1867. Joseph Clarke actually ran the Mermaid Hotel, not the Swan Inn, but on its side the picture of the mermaid on the coin is easily mistaken for a swan. 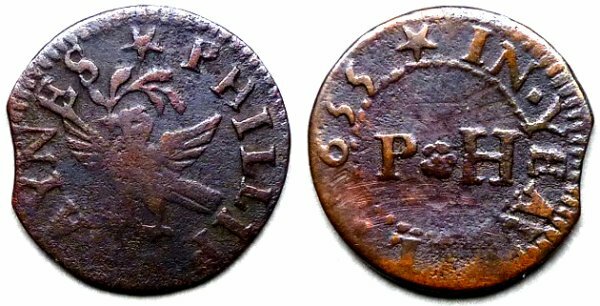 This is a scarce copper halfpenny token from my collection issued in 1797 during the French Wars when another national shortage of currency occurred. It was produced for late eighteenth century sailcloth manufacturers Brett & Cayme of Yeovil. The obverse has script 'B&C' over 'YEOVIL' over 1797. The reverse featured a man working a large box weaving loom. It is 29mm in diameter and has a smooth edge. 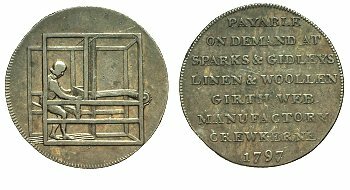 At left is a token from my collection with an almost identical (compare the areas of the man's head and feet) reverse of a man working a hand loom on a token also dated 1797, but issued by Sparks & Gidleys, Linen and Woollen Girth Web Manufacturers of Crewkerne. 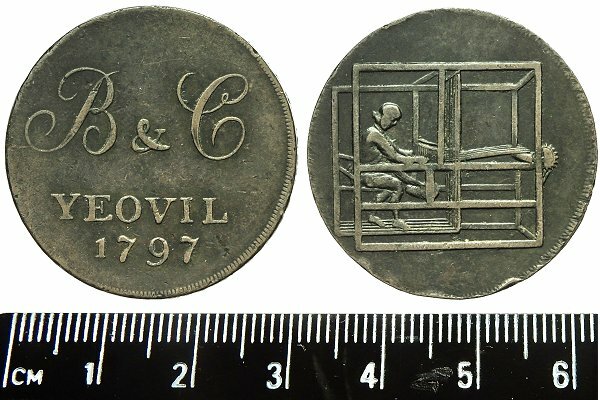 The same reverse design (albeit completely filling the reverse) has also been observed on a 1792 halfpenny of John Kershaw, Rochdale, Lancashire and on a 1796 halfpenny of the Sail Canvas Manufactory of Plymouth, Devon. This is an unusual Victorian trade token issued by Bristol-born Charles Gardiner who was a tea dealer, grocer, provisions merchant and wine & spirits merchant in the Borough and is only recorded in trade directories between 1850 and 1852. By 1861 he had left Yeovil. The token is 25mm in diameter. On the obverse it reads "GARDINER'S GENUINE T WAREHOUSE - MARKET PLACE - YEOVIL". On the reverse it says "EIGHT OF THESE WILL BUY AN OZ. (ounce) OF TEA AT GARDINERS - MARKET PLACE - YEOVIL". The top image is an illustration for clarity, the lower image is the example in my collection. The Yeovil Industrial Provident Society was an early society in Yeovil based along similar lines to the later Co-operative Society. The society began in 1858 but only lasted until 1862. The very scarce ½d dividend check or token in my collection, shown above, was issued by the society and the short life of the society dates the token with some accuracy. The token is 22mm in diameter, 0.75mm thick and made of stamped, tinned iron. A bronze one shilling token and a stamped tinned iron token for one pound are also known. 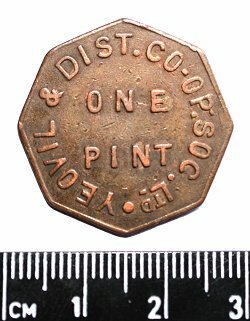 A bronze commodity token, from my collection, issued by the Yeovil & District Co-operative Society for a pint of milk. This type of token started to come into use after the First World War. They could be purchased at the local co-op as required, or in bulk and the value credited to your dividend account. The tokens could be left out or given to the delivery man meaning deliveries were speeded up as no cash was involved or change given. This token is 27mm point-to-point, 25.3mm flat-to-flat. Obverse and reverse are identical. 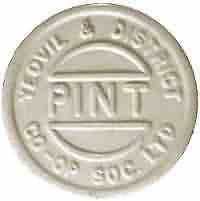 An oval bronze token for a half pint of milk is also known. 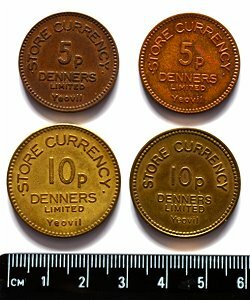 When the price of the commodity was altered a token of a different shape or different colour was usually issued to denote this, especially with the later Yeovil plastic tokens of the 1950s / 60s which are known in cream (as this example), green, yellow, deep turquoise and red. These plastic tokens are 25mm in diameter and 1.75mm thick. 2s 6d, 10s and £1 were introduced and specimens are held in the Somerset County Museum collection. However, with frequent handling the notes became worn so the lower denominations were made from metal as seen here. The earlier issue post-decimalisation 5p and 10p at left have milled edges, the later issue, at right, have plain edges. A 50p token is also known. Tokens appear to have been discontinued in the store by the mid-1980s. This extremely rare two-penny token from my collection was issued by the Yeovil Guardian Friendly Society. The society, founded on 29 June 1835, had its headquarters at the Mermaid Hotel. By 1863 it had 342 members and capital of £3,930. The society often paraded at local events with their banner including the opening of the railway in Yeovil in 1853. The token is 29.2mm in diameter and 1.8mm thick. The obverse reads "YEOVIL GUARDIAN FRIENDLY SOCIETY" around a central number 2. 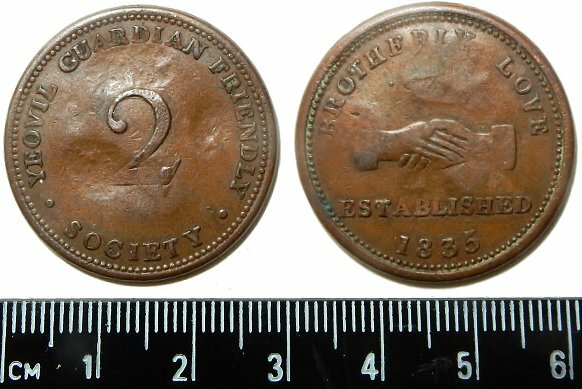 The reverse has the words "BROTHERLY LOVE" over a pair of shaking hands above "ESTABLISHED" over "1835". 'Tickets Checks & Passes from the County of Somerset' (Stephen Minnitt & David Young, published by SCC, 1990) recorded "No specimen traced". See also Commemorative Medallions below. See also Yeovil's Friendly Societies. Public house 'checks', a type of trade token, were frequently used in pub games, such as skittles or quoits where, for instance, players would 'chip in' a check to the 'kitty' which would be won by the winning team to redeem at the bar. By issuing checks a landlord could guarantee they would be spent in his establishment only. The great majority of Yeovil public house checks are from the late Victorian period. 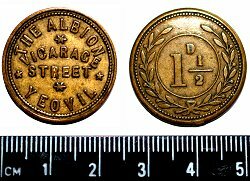 This is a public house 'check' or trade token from my collection, probably issued in the late nineteenth century, from the Albion Inn in Vicarage Street for the value 1½d. On the obverse is "THE ALBION" above "VICARAGE STREET" above "YEOVIL", the reverse has the standard open wreath containing the value 1½d. Made of brass, it is just under 24mm in diameter and is 1.4mm thick. This is a public house 'check' from my collection, probably issued in the late nineteenth century, from the Black Horse Inn, Reckleford for the value 1½d. On the obverse is "BLACK" above "HORSE" above "INN", the reverse has just the value 1½d. Made of bronze or brass, it is just under 22mm in diameter and is 1.7mm thick. At left is a public house 'check' from my collection which is easily dated since it was issued by John Reed when he was proprietor of the Mermaid Hotel and he was only recorded there in 1897. On the obverse is "MERMAID HOTEL" over "J REED" over "PROPRIETOR" over "YEOVIL", the reverse has the standard closed wreath containing the value 2d. Made of bronze or brass, it is just under 28mm in diameter and is 1.2mm thick. The lower example is different only in its value - 3d. At this time three old pence could buy you a good feed of tripe and onions. This is a twentieth century public house 'check' issued at the Alexandra Hotel, Station Road, during the period LC Smith was licensee - roughly between 1936 and 1947. It is made of brass, 24.5mm in diameter and with a plain edge. On the obverse it says "LC SMITH, ALEXANDER (note the spelling mistake) HOTEL, YEOVIL" and on the reverse is its value - 6d. At this time sixpence could buy you a roast beef dinner with vegetables or 2½ pints of stout. 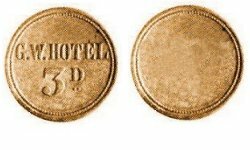 This is a public house 'check' or trade token issued at the Elephant and Castle Hotel, Lower Middle Street, during the period George Snelgrove was licensee - roughly between 1871 and 1881. It is made of brass. The check is 23.7mm in diameter and with a milled edge. On the obverse it says "GEOE. SNELGROVE - BOWLING ALLEY - ELEPHANT & CASTLE - YEOVIL" and on the reverse is the maker's name "S.A. DANIELL MAKER - 52 ST PAUL'S SQUARE - BIRMINGHAM" and the check's value - 2d. At this time two old pence could buy you a pint of stout. A public house 'check' from the Crown Inn in Huish, again to the value of 2d. Probably dating to the late nineteenth or early twentieth century, the obverse reads "CROWN INN" over "YEOVIL", while the rather plain reverse simply states the value of two old pence. At left are a couple of public house 'checks' issued at the George Hotel, Middle Street. The date of the upper token is unknown but the lower token was issued in the time when Robert Leach was landlord, thus dating it to 1879-80. They were made of copper, and were 23.8mm in diameter and with a milled edge. On the obverse of the upper check it says "MIDDLE STREET - THE GEORGE HOTEL - YEOVIL" and on the obverse of the lower example it reads "ROBERT LEACH - THE GEORGE HOTEL - YEOVIL" the reverse of both are identical and carry the maker's name "S.A. DANIELL MAKER - LION WORKS EDWARD STREET PARADE - BIRMINGHAM" and the checks' value - 2D. At this time two old pence could buy you a pint of stout. Another twentieth century 'check' issued at the Glovers Arms, Reckleford, during the period William Bond was licensee - from about 1911 until 1923. It is made of brass, is 23.8mm in diameter and has a milled edge. On the obverse it says "WILLIAM BOND - GLOVERS ARMS - YEOVIL" and on the reverse, within a wreath, is its value - 2d. Again worth a pint of stout. At left is an undated, but probably early twentieth century, public house 'check' or trade token issued at the Great Western Hotel, Camborne Grove. It is made of brass, is 26.2mm in diameter and has a milled edge. The reverse is plain but on the obverse it says "G.W. HOTEL" and its value - 3d. At this time three old pence could buy you a pint of beer. This is an undated, but probably late Victorian, public house 'check' issued at the Half Moon Inn, Silver Street. It is made of brass, is 18.7mm in diameter and has a plain edge. On the obverse it says "HALF MOON - HOTEL - YEOVIL" and on the reverse the name of the maker "E SEAGE. MAKER - 17 CODRINGTON ST. EXETER" and is its value - 2d. At this time two old pence could buy you a pint or two of ale. At left is an undated but probably late Victorian public house 'check' issued at the Pall Hotel, Silver Street. It is made of brass, is 25mm in diameter and has a milled edge. The reverse is plain but on the obverse it says "PALL HOTEL, YEOVIL" and its value - 2D. At this time two old pence could buy you a pint of stout. This is an undated, but probably late Victorian, public house 'check' or trade token issued at the Pen Mill Hotel. It is made of tinned brass, is 23.7mm in diameter and has a plain edge. On the obverse it says "PEN MILL - HOTEL" and on the reverse, within a wreath, is its value - 1½d. At this time a penny-halfpenny could buy you a pint of ale. 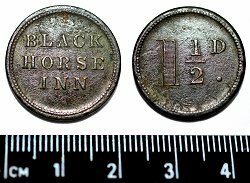 This undated public house 'check' or trade token is attributed to the Three Choughs Hotel. It is early Victorian, made of brass, is 23.4mm in diameter and has a plain edge. On the obverse it says "C.R.S." and its value - 3d. At this time three old pence could buy you a good roast beef dinner. On the reverse is "M. BULLEN" for Maria Bullen who was licensee of the Three Choughs Hotel from at least 1830 until at least 1861. This check, possibly later eighteenth century, is tentatively attributed to the Three Choughs Hotel. It too is made of brass, is 22.8mm in diameter and has a plain edge. On the obverse is a bird, presumably a Chough, and on the reverse "C H" - presumably the initials of Chough's Hotel. No denomination is marked. Industrial checks were used to record that a workman was present on a shift, in relation to pay or as receipts for tools issued from a central store. Only two Yeovil companies are known to have produced industrial checks - Petters and Westlands. These brass checks - the two in my collection are both stamped '246' on the plain reverse - were issued by Petters Limited. Around the edge of the obverse is "PETTERS LIMITED" and "YEOVIL" around a central nautilus, the logo of the company based on James Petter's Nautilus Fire Grate. 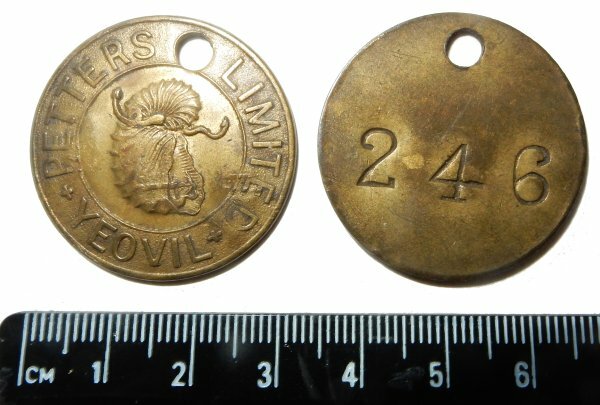 These tokens probably date to the inter-war period and were used at the Nautilus Works in Reckleford. Of brass, the tokens are 32mm in diameter and 1.8mm thick. These three aluminium industrial checks in my collection were issued by Westland Aircraft after the Second World War. All are just under 33mm in diameter and 1.7mm thick. The reverse of all are plain. The examples at left and centre read "WESTLAND AIRCRAFT" around the top and "JIGS AND TOOLS" around the bottom while that to the right reads "SMALL TOOLS" across the bottom. I have three un-numbered and three numbered as centre and right. 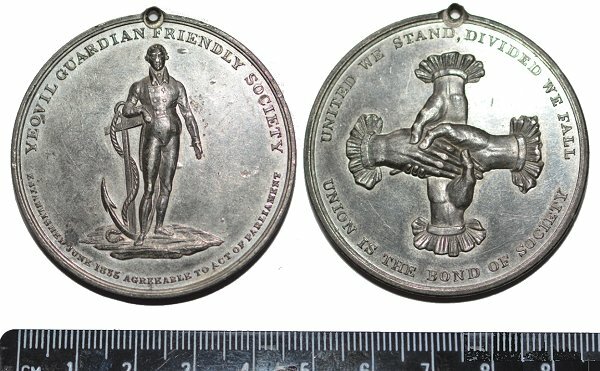 The large and almost unique commemorative medallion in my collection, illustrated below, was issued by the Yeovil Guardian Friendly Society. There is only one other known example of this medallion which is in the Community Heritage Access Centre but is in very poor condition. The society, founded in June 1835, had its headquarters at the Mermaid Hotel. By 1863 it had a membership of more than 300 and often paraded at local events with their banner including the opening of the railway in Yeovil in 1853. This photograph features in my book "A-Z of Yeovil". See also Friendly Societies above. The above scarce commemorative medallion in my collection was given to Sunday school children of Yeovil by the then Mayor of Yeovil, Sidney Watts, to commemorate the marriage of HRH Prince George (1865-1936), later King George V (reigned 1910-1936), to HSH Princess Mary of Teck 1867-1953. Mary (full name Victoria Mary Augusta Louise Olga Pauline Claudine Agnes) was informally known as 'May' after the month of her birth - hence the name on the medallion. The medallion is just over 38mm in diameter and 2.6mm thick. 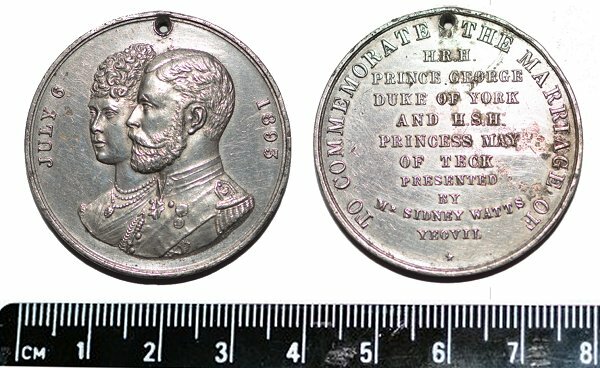 The obverse carries profile portraits of the prince and princess with the date of their marriage, July 6 1893, around the edge. The reverse carries the edge inscription "TO COMMEMORATE THE MARRIAGE OF" and a central inscription reading "HRH PRINCE GEORGE DUKE OF YORK AND HSH PRINCESS MAY OF TECK PRESENTED BY MR SIDNEY WATTS YEOVIL". 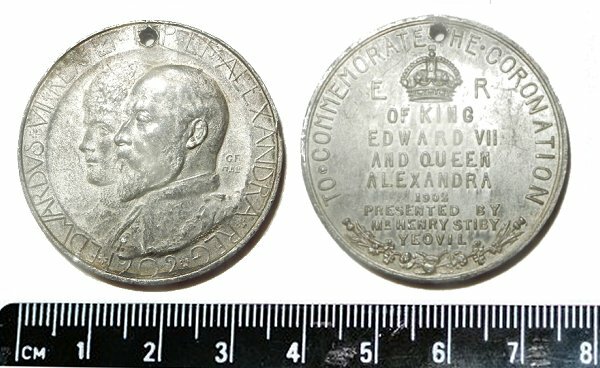 The above scarce commemorative medallion in my collection was given by Henry Stiby, later Mayor of Yeovil, to school children to commemorate the coronation of King Edward VII (reigned 1901-1910) and Queen Alexandra. The medallion is 35mm in diameter and 2.5mm thick. The obverse carries profile portraits of the king and queen with "EDWARDUS VII REX ET IMP ET ALEXANDRA REG. 1902" around the edge. The reverse carries the edge inscription "TO COMMEMORATE THE CORONATION" and a central inscription reading "OF KING EDWARD VII AND QUEEN ALEXANDRA" over "1902 PRESENTED BY MR HENRY STIBY YEOVIL" below a royal crown motif between "ER". The edge is plain. 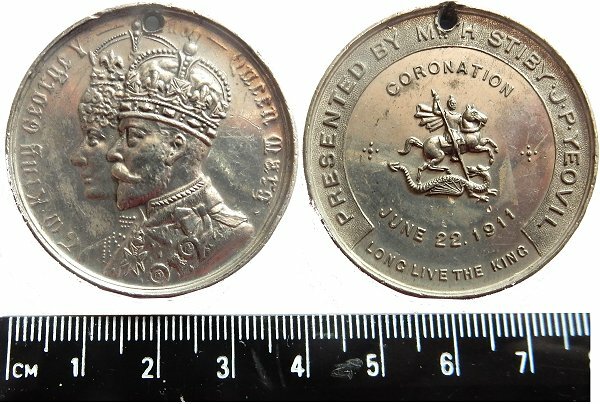 The above rare commemorative medallion in my collection was given by Henry Stiby to younger schoolchildren to commemorate the coronation of King George V (reigned 1910-1936). The medallion is just over 38mm in diameter and 2.8mm thick. The obverse carries profile portraits of the king and queen with "KING GEORGE" and "QUEEN MARY" around the edge. The reverse carries the edge inscription "PRESENTED BY MR HENRY STIBY JP. YEOVIL" and a central inscription reading "CORONATION" above and "JUNE 22 1911" below a central motif of St George and the Dragon. At the very bottom is "LONG LIVE THE KING".